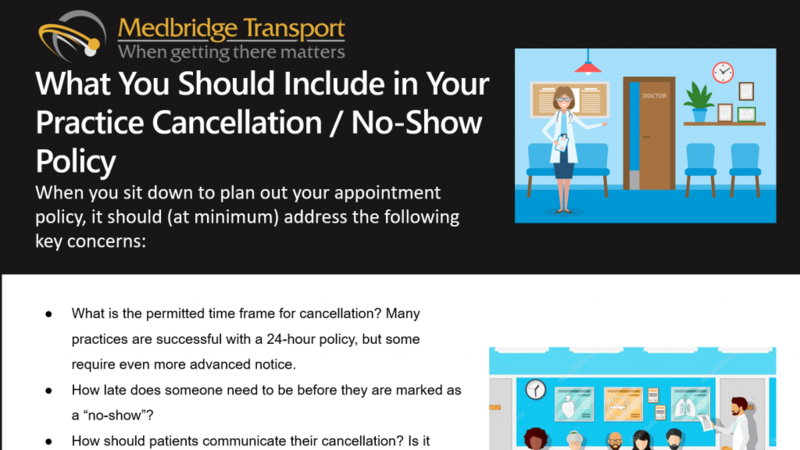 As anyone who operates an appointment-based business will tell you, having a well-planned cancellation/no-show policy in place is an absolute must. The challenge, though, is determining what exactly should be included, how subjective or flexible the policy should be, and who has the ultimate responsibility or deciding when exceptions will be allowed. What is the permitted time frame for cancellation? Many practices are successful with a 24-hour policy, but some require even more advanced notice. How late does someone need to be before they are marked as a “no-show”? How should patients communicate their cancellation? Is it acceptable to call, text, email? Will there be any sort of penalty in place for patients who repeatedly fail to show for appointments? What are the circumstances or reasons that might warrant your team making an exception to the policy? How will this policy be shared with new and returning patients? It’s a fact that different medical practices have different needs when it comes to planning a cancellation/no-show policy, so be sure to consider all of the factors that affect your business, team, and workflow. It would also be a great idea to look at the causes of chronic appointment cancellation to see how you might minimize their impact on your daily routines. If you find that lack of adequate transportation is a common contributor to your company’s issue with last minute cancellations and no-shows, be sure to give us a call here at MedBridge Transport. We would love to be a partner to your business, helping you improve profitability and the quality of your overall patient care. The rising cost of healthcare operations has made it imperative for providers to manage the flow of patients into and out of the care setting. Late admissions and delayed discharges can represent a significant overhead cost and burden to your staff, resulting in an overall lag in procedure efficiency and a decline in the quality of care you provide. Implement a strong pre-admissions protocol, including pre-procedure counseling, appointment reminders, inter-specialty communications, transportation support, and more. Have a standard procedure in place for patient discharge. Be sure to keep the patient informed of their planned discharge time and deliver discharge instructions beforehand. Partner with a non-emergency medical transportation service to ensure that your patients arrive to your outpatient facility on time and are able to be transported home as soon as they are ready to leave. At MedBridge Transport, we understand how important it is to keep your operations running smoothly, from open until close, every single day. We have made it our mission to support healthcare providers in that effort, as well as being a safe and reliable resource for patients who require transportation assistance. Contact us today to learn how we can help you improve your admission and discharge process.